Adult male specimen from Hamamatsu, Shizuoka Prefecture, Japan. Adult female from Shizuoka Prefecture, Japan with eggs visible as a blue mass. 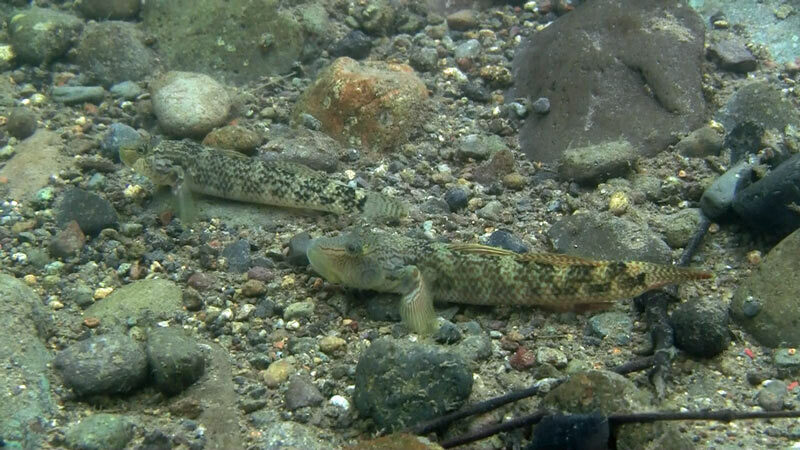 Adult pair photographed in their natural habitat in the Izu Peninsula, Shizuoka Prefecture, Japan. Adult male in its natural habitat. Adult female in its natural habitat. 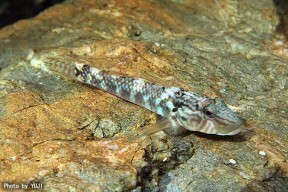 Adult male from Okinawa island, Japan. Young adult male from Okinawa island, Japan. Rhinogobius: from the Greek rhinos, meaning ‘nose’, and the generic name Gobius. Widely-distributed throughout the majority of Japan with the exception of Hokkaido, the northernmost island in the archipelago. Inhabits smaller tributaries and streams with substrates of gravel, rocks, boulders, and exposed bedrock which undergo seasonal variations in water flow rate, depth and turbidity. 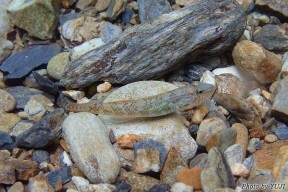 Some wild populations have evolved a complex amphidromous breeding strategy in which adults live and spawn in freshwater or brackish streams and the pelagic post-hatch larvae are washed downstream to the sea where the post-larval fry spend the first part of their life developing in estuarine nursery zones under brackish to full marine conditions. Once they reach a certain stage of development they begin to migrate upstream with some moving into freshwater tributaries and others remaining in lower, tidally-influenced habitats. Other populations are land-locked with the entire life cycle occurring in freshwater, and these tend to produce larger eggs than the amphidromous forms. 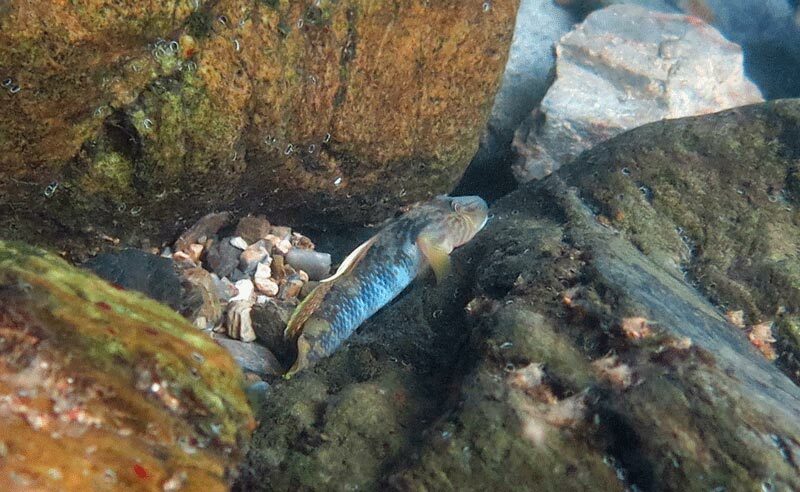 In nature the fish are reproductively active from summer to early autumn and during this period males begin to defend territories which tend to be centred around a flattish rock or stone beneath which the eggs are deposited. Post-spawning the female is ejected and the male assumes responsibility for brood care and guarding. 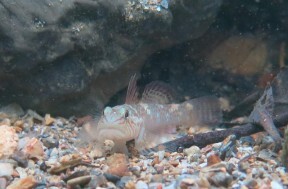 This unidentified species is a member of the R. brunneus complex of closely-related species within the genus Rhinogobius. Members share the following combination of characters: predorsal naked, or with small cycloid scales, the scaled area never extending beyond the vertical of the posterior margin of the preoperculum; cheek with 2 mainly horizontal rows of sensory papillae. There are a number of unidentified species within the grouping of which several are referred to using a two-letter code based on some diagnostic character of their respective colour pattern, with ‘CB’ shorthand for ‘cross band’ in reference to the dark bars on the body. R. sp. ‘CB’ is the commonest member of the grouping in Japan but has not yet entered the international aquarium trade as far as we know. 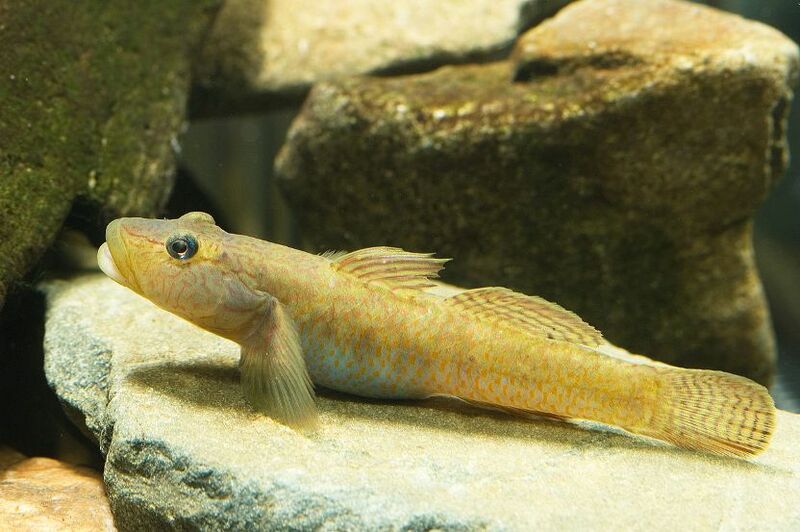 A taxonomic review of the gobiid fish genus Rhinogobius Gill, 1859, from Taiwan, with description of three new species. Migratory history of the freshwater goby Rhinogobius sp. CB in Japan.